The space-shooting genre is nothing new. In fact, games like Asteroids, Space Invaders, and Defender defined an era of hit arcade games that kicked off the video game boom. However, retro is definitely in, especially ‘80s culture. So, it makes perfect sense to release a beefed-up version of Asteroids for the Nintendo Switch. Of course Astro Duel Deluxe could have ended up being a horrible mess, but somehow the developers have taken the tried-and-true formula and injected their own insanity into the mix to create something that can be very entertaining when playing against friends. From the get-go, it’s obvious that Astro Duel Deluxe isn’t going to light your world on fire with state of the art graphics or innovative gameplay. What it does, and does well, is take the game of Asteroids, add up to six players, throw in some power-ups, and let the chaos begin. The game has a very low-fi look to it, but somehow the pixels still manage to hold up on the big screen. There aren’t any special frills here, but it’s not really needed for an arcade party game of this type. Moving your ship around is easy, with a button to thrust. You have up to three bullets in your reserve (they float around your ship). You can rapidly discharge all three of them, or be more selective in your aim. The bullets regenerate, but if you use all of your weaponry up you’ll make yourself open to attack from the other players. Luckily there are a wide variety of stages to play, each with their own walls, barriers, and other hazards. Sometimes the best way to survive is to retreat around these obstacles to avoid enemy fire. The goal of the game is simply to be the last ship standing. You need to take out the rival ships by blowing them up. There are different modes of play that determine what constitutes as a kill. The default mode is to kill the pilots, which requires two kills to off the player. Blowing the ship up is just the beginning, but then their tiny little space dude can swim around in the vacuum of space. If they manage to get away for a long enough period of time, their ship will regenerate and they’ll come back full force. You’ll need to ram them with your ship or put another bullet in them to finish the job! Ship Hunters just requires you to blow up the ship, so if one-hit kills are your jam this one’s for you. Astro Duel Deluxe supports every type of control method you can think of for the Switch. You can just use the Joy-Con controllers, which works great for this game, or the Pro Controller, or the Grip, or even the touch screen if you’re want to all gather around the small display. Whichever you choose to utilize, the game is fairly simple to learn. Really the only aspect that takes some getting used to is the physics of moving the ship. As you fire your bullets, your ship will propel backward in the opposite direction. This is normally not an issue, but more than one death was caused by firing weapons and accidentally being pushed backward into a hazard that inflicted insta-death. Controls are otherwise as you’d expect: Control Stick to turn, B button to thrust, Y button to shoot, and A button to use a special weapon. Speaking of special weapons, as the round progresses, special orange asteroids appear and can be destroyed, leaving power-ups behind. There are quite a few different ones to collect, including a shield to protect against enemy fire, a reflector to bounce bullets back at foes, a proximity mine to blow up passers-by, and a multi-shot weapon burst that can take out multiple ships at once. In our gameplay matches, it was usually a mad rush to acquire these special weapons, since they can often make the difference in a firefight. There are tons of options in the game to select to create just the experience you and your friends are looking for. Things like instant replays, screen shaking, and dynamic camera can be shut off if so desired. The amount of kills necessary to win can be customized as well, so you can go for quick matches or longer stretches. Other game changers include the ability to turn off power-ups, start with a power-up, turn on friendly fire (that would be absolute chaos), and turn off sudden death. Much like the Bomberman games, the levels are timed and if the round is taking too long, a sudden death begins, where two huge lasers begin to squeeze in from the left and right edges of the screen, narrowing the playfield. One touch from these hot fiery walls of doom will kill you instantly. This is a great way to keep the rounds moving along, but some might prefer to turn that option off to see who is truly best at the game. 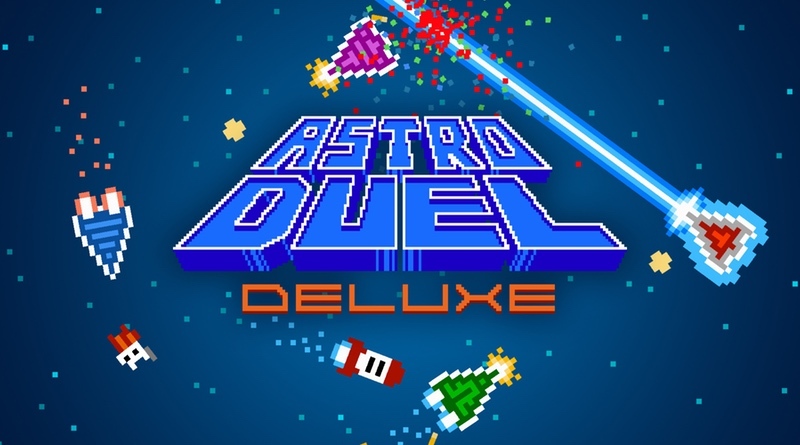 Astro Duel Deluxe is a game that is simply average in single player mode, but takes on a life of its own in multiplayer. The game is so much more entertaining with a bunch of friends going at it, trash-talking optional. The game allows for each player to be on their own or you can turn on teams for some friendly competition. Overall, the game is more fun than I initially anticipated. There aren’t any graphical frills here. From the sparse and basic looking menus to the pixelated main game, this one’s definitely not pushing the limits of what the Switch can accomplish. But, I’d argue that’s not necessary here, and in fact it has a certain charm to it thanks to its basic visual presentation. The music is at least good and keeps the action flowing nicely. Plus, special props to the sound designers for that oh-so-satisfying “splat” sound that accompanies a pilot’s death. Their floating skull is just icing on the cake. If you’re looking for a fun multiplayer game that’s easy to pick up and play, Astro Duel Deluxe will fit that bill nicely. This is the very definition of a game for all ages, and with the Switch you could easily play a few matches anywhere you go. The game could probably use a few more power-ups and maybe some more stages, but for $14.99 it’s a good time. If you’re looking for a fun party game to play with your friends without breaking the bank, Astro Duel Deluxe is a good choice. Its simple controls and easy to understand gameplay mechanics make it a fun game for gamers of all skill levels. Don’t expect amazing visuals, but a game like this doesn’t need them.